(Bloomberg) — Australia’s dollar is at risk of sliding to 70 U.S. cents this year as China’s economy slows and the Federal Reserve keeps raising U.S. interest rates, according to BlackRock Inc (NYSE:BLK). The Aussie tumbled below 74 cents on Tuesday for the first time in a year amid a worsening trade dispute between the U.S. and China, Australia’s largest trading partner. 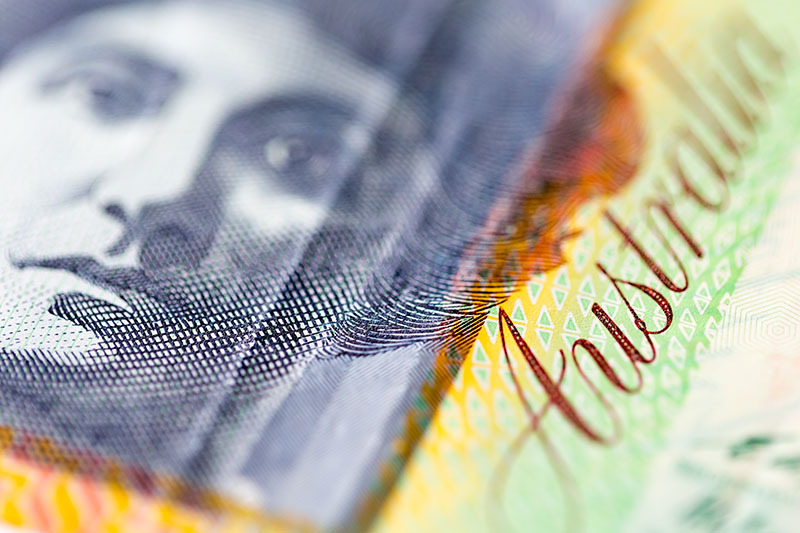 The currency faces more pressure as policy divergence sees Australian bond yields drop further below those of U.S. Treasuries, said Craig Vardy, BlackRock’s head of fixed income for Australia. The Aussie last traded at 70 cents in February 2016. “There are conditions that could get it there — rate differentials is definitely one of them, the potential for China slowing is another,” Vardy said in an interview this week in Sydney. Slowing local lending growth may also add strain to the economy and currency, he said. BlackRock joins the growing ranks of asset managers turning bearish on the Aussie as growth in China cools even before threatened U.S. trade tariffs take effect. Heaping on more pressure is a Fed that has already raised interest rates seven times since December 2015, while the Reserve Bank of Australia is forecast to keep its benchmark at a record low until at least the middle of next year. The Aussie may extend declines to the “mid-60s” within the next 12 months, Pendal Group said last week, while Westpac Banking Group said it may drop to 70 cents in 2019. Hedge funds have ratcheted up wagers against the currency, shifting from a net long position in early March to a net short one in May, according to data from the Commodity Futures Trading Commission. BlackRock in the first quarter cut its six-month forecast for the Aussie to a range of 78 to 73 cents, from an earlier prediction of 80 to 75, Vardy said. “Probably 73 sees it out in the short term, however on a longer-term horizon there is potential for it to go below that,” he said. The currency sank to 73.47 cents on Tuesday, its lowest in a year, before trading at 73.80 as of 8:57 a.m. in Sydney on Wednesday. Australia’s 10-year bond yield fell five basis points Tuesday to close at 2.61 percent, compared with 2.87 percent for similar-maturity U.S. Treasuries. The Aussie yield shortfall may swell to 50 basis points in 2019 amid further monetary policy divergence, Vardy said. A booming American economy means the U.S. dollar is poised to extend recent gains, potentially rising another 5 percent, Vardy said. Further Fed tightening should see benchmark Treasury yields climb to 3.25 percent by year-end, he said.